My mom told me last week about two loons on the lake after the ice started to melt. When the wind picked up, the ice blew toward the shore, leaving less and less water around them. She learned that they need open water for their runway, to allow take off. The slushy ice that crept toward them made take-off impossibly exhausting. They couldn’t do it. 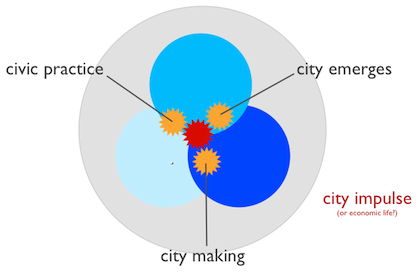 The city-making exchange is a similar exchange: we are all species interacting with our habitat. In our case, there is one key difference – we are making the habitat that we are using for our evolutionary runway. And we need to build the right runway, one that gives us energy, not depletes. That gives us lift. We make the cities that serve as our runways. Over the course of the last several weeks I have been exploring The City Making Exchange, Chapter 8 of the book I am working on: Nest City. (For a recap of where I’ve been on the blog, visit The plot for part 3.) – the relationship between where we want to go (destination) and our personal, individual and collective, journeys. Here are the highlights The City-Making Exchange, the relationship between where we want to go (destination) and our personal, individual and collective journeys, in the form of principles and practices for life and work in the city. The purpose of cities is to allow us to reach our fullest potential. City making is driven by our impulse to create the conditions for each and all of us to survive and thrive – as individuals, families, neighbourhoods, organizations, nations, our species and our planet. Everyone, everywhere is creating city life. There is an endless city-citizen transaction. When we follow passion, the city changes itself to serve us better. Follow your passion to change your city. As we trust in and pursue our passions our cities regenerate. Further, the city gives us opportunities to pursue our passion; the city helps us find ourselves and in doing so we regenerate ourselves and our city habitat. We tell the stories that shape our cities. We shape the stories we tell ourselves and each other about our cities – at every scale of time and geography. Our landscape shapes us and we shape our landscape. Are we telling the stories we want and need to tell? Pursue your passion. It takes practice to follow your passion, so find people who share your passion and spend time with them. In ways you can’t imagine, they will support you. They are your collaborators to help you – and the city – make more work you love. Serving the city well means to boldly grow the self. Focus on what matters. We can easily be distracted from what we truly care about. Two examples: when caught in fight drama, the thrill of a fight overrides what’s really important, or the “I haven’t been asked” trap that coaxes you into thinking you need another’s permission to follow the yearning in your soul. Jump in. Your contributions matter, to both your personal development and that of your city. Its worth risking an exchange with your city, because all kinds of work matter. Just as our work builds on those who have come before us, the cities to come need our work to build upon as well. Adjust structures along the way. Every aspect of city life needs structures that meet our needs. The trick is knowing structural purpose, when creating, adjusting or jettisoning structures. 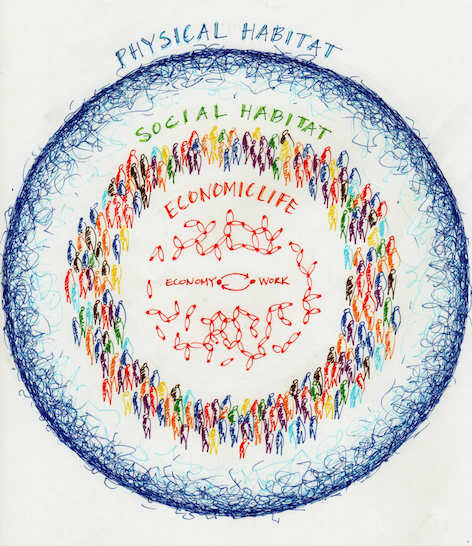 Our journey requires structure that meets our needs in each context in which we find ourselves, and our changing social, physical and economic habitats. Know who your city wants to be and where it wants to go. The city-making exchange means noticing the direction we wish to go in and our relationship with that direction, how we’ll get there, and who we’ll be along the way. Here’s a wee example of what happened in my city – the Awesome Neighbourhoods for a Sustainable Edmonton workshops. Just as loons need the right kind of runway (they did eventually make it), we need runways that don’t tire us too. Where are you pursuing your passion in your city? Under what conditions do you get lift-off? Chapter 8 – The City Making Exchange is about getting where we want to go. How can we know if we are making the cities we want and need? By choosing to build cities purposefully, a necessary transaction emerges: we need to know if we are getting what we are seeking. This chapter explores the feedback loops and mechanisms to notice if we get what we want. 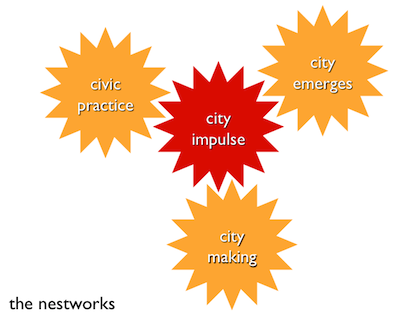 Chapter 9 – Enduring Civic Practice explores how citizenship affects our ability to create cities that serve citizens well. How we ‘show up’ has an impact on the well being of ourselves and our city. Our practices create the conditions for us to each offer the diversity of work needed for the city to be able to met the needs of its inhabitants. There is a deeper knowing in us in our work and life – what will it take to find it? 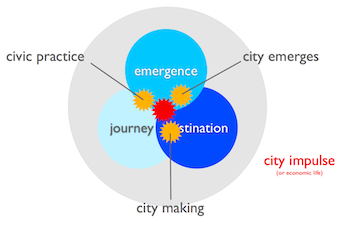 Chapter 10 – The Emerging City asks how our collective practice creates cities that serve citizens. Humanity has a great desire to live life beyond mere survival.We desire, deeply, to thrive and this is why we build cities. As past civilizations have fallen, so too will ours without making the necessary connection between our economic life and our social and physical habitats. We can choose to create the conditions to thrive in ways we have yet to contemplate by searching for processes that allow us to aim for a destination – even if we do now know exactly what it is. Chapter 11 – Nest City wraps up this endeavour – for now. The sweet spot in the nestworks is scalar – it is found in individuals, families, neighbourhoods, cities, regions, continents, etc. It is elusive, but it is the place that knits our journey with a destination and the surprise of things that emerge. It is where we notice the kind of city we wish to create and the practices that are needed to move in that direction. It is about noticing what we need to thrive and organizing ourselves to create cities that will support us on our evolutionary journey.